Donegal's Rhys Irwin underwent a testing first weekend in the all new British Talent Cup at Donington Park as the championship joined the British Superbike Championship for its 2018 season opener. Despite a tough weekend the fifteen year old left the Derbyshire venue feeling confident having been third quickest in free practice before mechanical issues upset his championship debut. 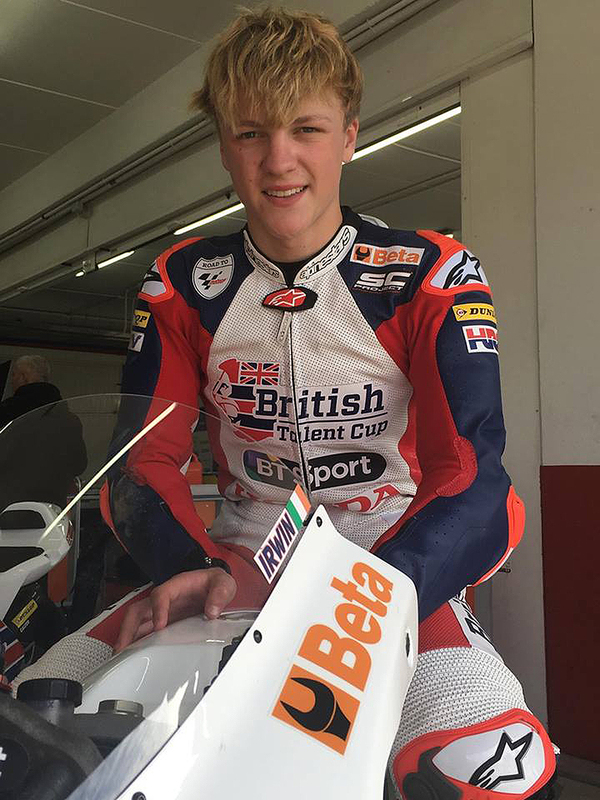 The Talent Cup season had stated well for Irwin with testing in Valencia, at the start of March. Following a strong run at the unfamiliar Spanish track, he arrived at Donington Park circuit full of confidence and finished up fourth in the wet opening session, best of the riders with no previous Moto3 experience. The Kilmacrennan lad went one better in the second practice to finish in the top three and once again best of the Moto3 rookies. Heading into qualifying Rhys was confident he could at least match his practice result but things started to go astray almost immediately. Having sat second in the opening laps he began to tumble down the order as a mechanical issue ruined his chance of a strong grid position, eventually finishing seventeenth. With his problems rectified for the race, the only Republic of Ireland representative in the championship quickly moved through the field and was in the top ten and closing the gap to the leaders after just two laps. Picking off places on the wet but drying track was treacherous and when Irwin was pushed wide as he tried to move into ninth place he put a wheel onto one of the slippery Donington kerbs resulting in a fall and the end of his race. With a strong showing in practice and the early laps of race one the Donegal teenager was looking forward to making amends in race two but this fell foul of Monday's teeming rain, as it was canceled, leaving him no chance to take a positive race result from the weekend. 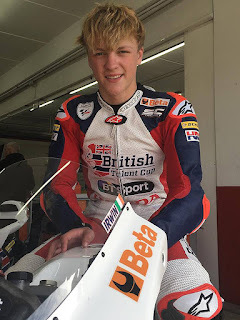 “This was my first weekend with the British Talent Cup Road to MotoGP programme and it was an absolutely fabulous experience despite the demanding schedule.” said Rhys. “During free practice I felt good and ended the session in P3 but qualifying didn't go so well as I had technical issues which left me 17th on the grid for race 1. In the race I pushed through and was challenging for eighth when I ran onto a kerb and crashed out. The Talent Cup returns to Donington Park on May 26th and 27th when it supports the World Superbike Championship. Rhys will be back in action before then however, as he will make his Moto3 Production class debut, on the Honda provided to him by Motorcycling Ireland, at the next British Superbike event at Brands Hatch two weeks time.